Note: All units are technically Allied U-2. Except as indicated below, all Allied force dispositions in Libya are per F. Watson’s “Enter Rommel-II” Europa Battle Scenario found in TEM#71. Except as indicated below, all Allied force dispositions in Egypt conform to the ER-II Scenario stipulations. 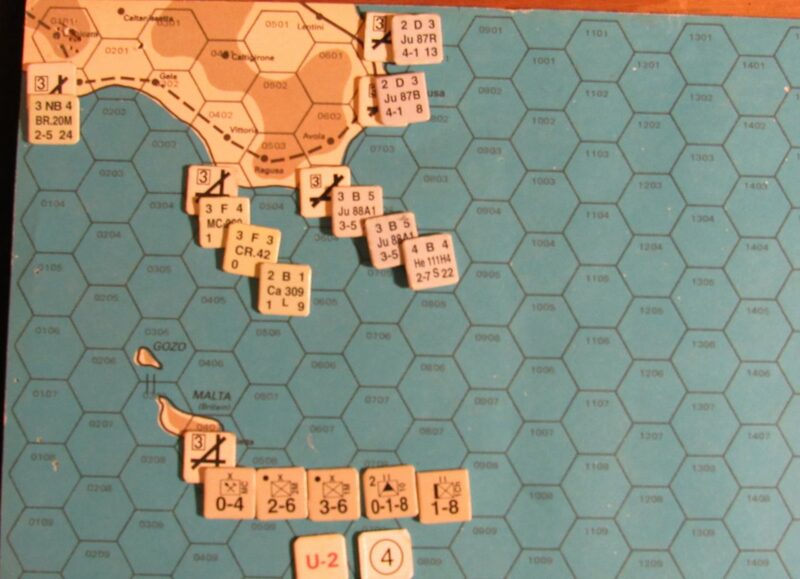 The ER-II Scenario shows the Aus 2-8 Inf X 19 in the Greece Holding Box. 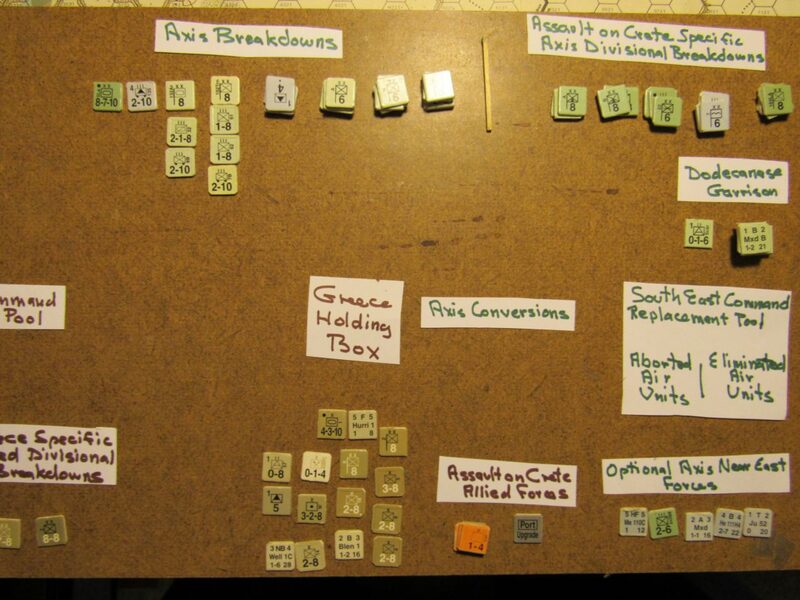 In the 1941 ME/ER-II/Crete Scenario Mar II 41 Axis turn at-start set-up it is placed in Egypt in order to better comply with the WitD Allied OB booklet’s Apr I 41 Allied turn Transfer to Greece stipulations. All Allied force dispositions in Palestine conform to the initial force stipulations found in the ER-II Scenario. Note: the marine cmdo unit is technically Axis U-1. 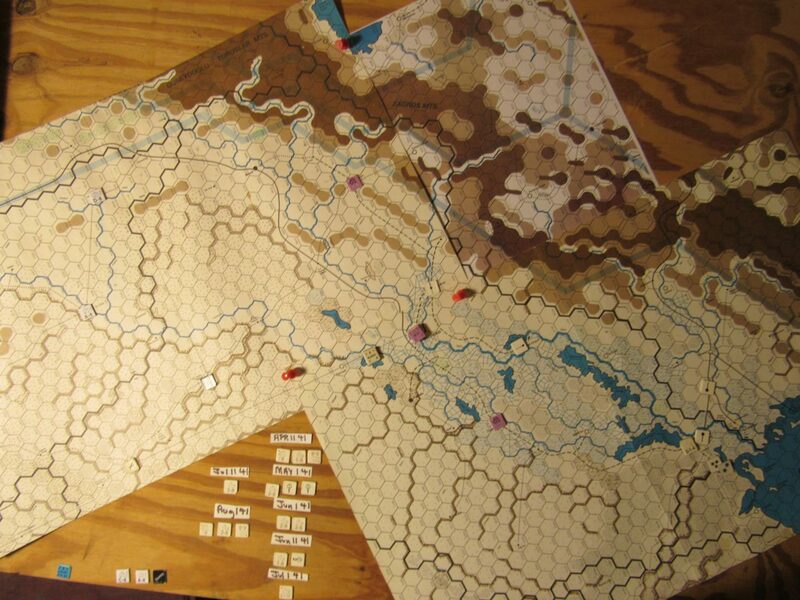 Note that in the WW 1941 ME/ER-II/Crete Scenario BF map 15B is placed below WD maps 18A, 19A and NE map 20A. This is different than the BF 15B map overlap stipulations found in the official WW scenarios such as the “Desert and the Balkans” Scenario or the “Wavell’s War” Scenario. 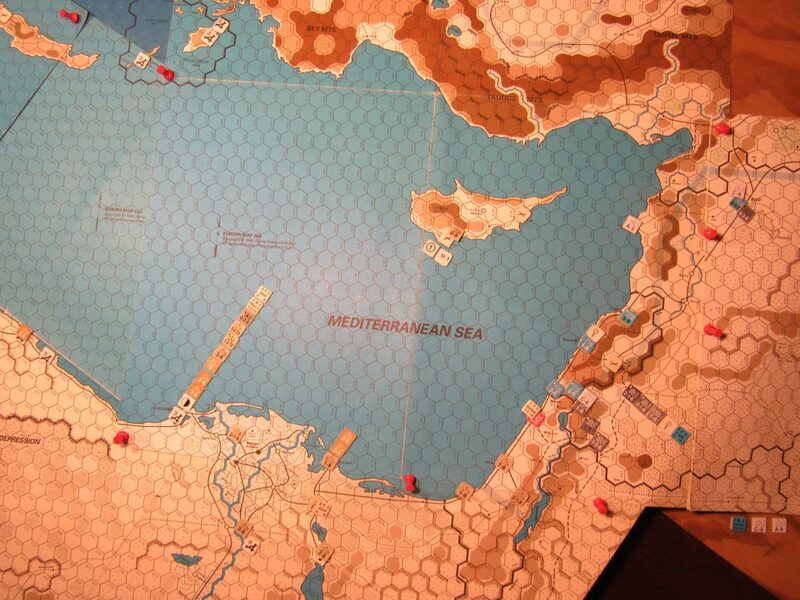 No game action is permitted on the exposed portion of map 15B until the occurrence of the “Assault on Crete” segment of the 1941 ME/ER-II/Crete Scenario, which begins on the May II 41 Allied turn. The “Assault on Crete” segment is then linked with the WW ME/ER-II core Scenario as essentially a reduced WW “Desert and the Balkans” Scenario. 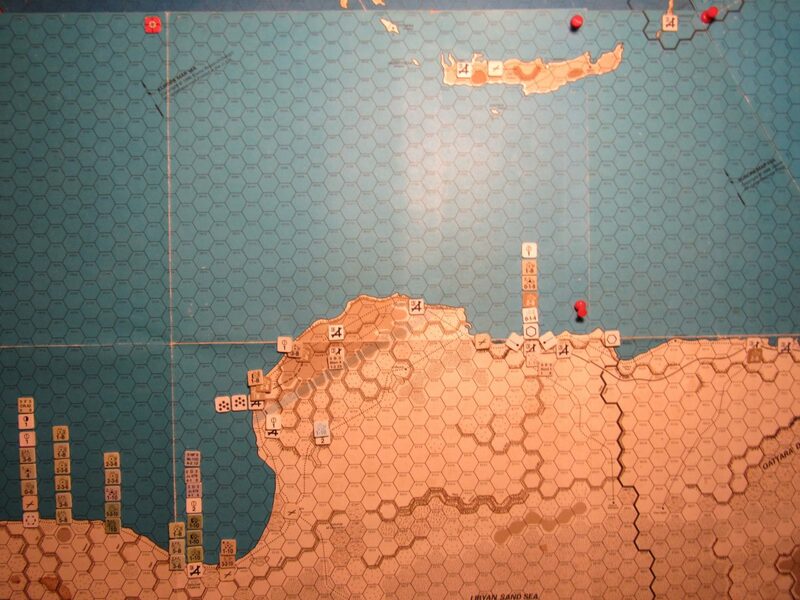 The Crete segment ends with the voluntary German cessation of operations in the Balkans, per essentially Rule 3E5b. At the beginning of the second Axis turn after the implementation of Rule 3E5b-Voluntary Cessation of Operations in the Balkans, which is necessarily used in the 1941 ME/ER-II/Crete Scenario, 3-cap permanent airfields (w/out hits) appear at Khania (18A:4403) and Erakleion (18A:4903). 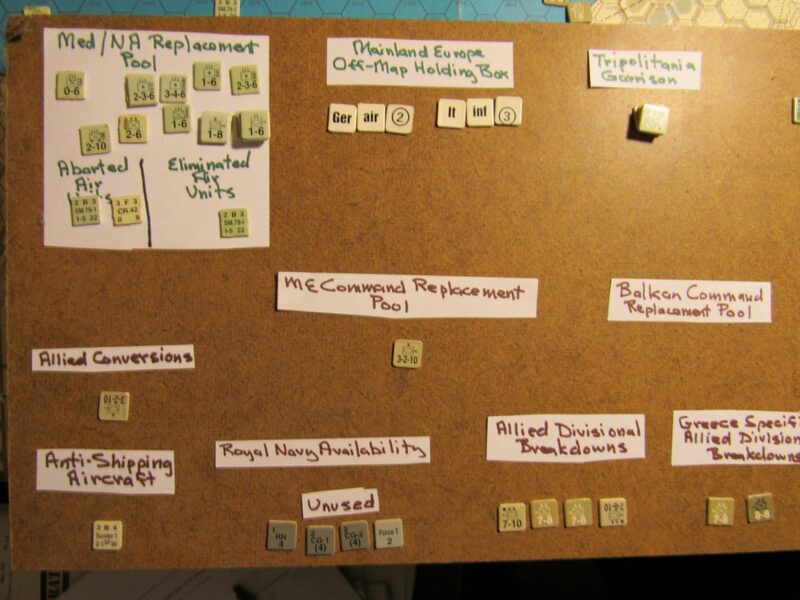 This appears to coincide with the WitD Allied OB booklet for the WW WD Scenario situation. Iraq begins the 1941 ME/ER-II/Crete Scenario as a pro-Allied neutral. The Allied forces in Iraq dispositions indicated below are based on the WitD Allied OB booklet and F. Watson’s “Iraq: Rashid Ali and the Golden Square” Europa Battle Scenario found in TEM#81. This is based on the ER-II Scenario. Accumulated Allied Replacements: 5 Br Inf RPs, 1.5 Br Arm RPs, 0 Br ARPs, 1.5 NZ Inf RPs, 1.5 Aus Inf RPs. [per ER-II] All accumulated Allied inf and arm RPs are stored at the Alexandria hex.